Red Sea’s spectacular Peninsula style and super-sized REEFERS are coming your way this spring! Available in 125cm (49.2″) long/ 500 liter (132 gal) or 160cm (63″) long/650 liter (173 gal), the REEFER™ Peninsula offers an impressive and elegant room divider solution with all of the features of our advanced REEFER systems. A rimless, ultra-clear glass coral reef aquarium is formed into a perfect peninsula that gives you a fascinating view from all three sides, adding complexity and intrigue to any reefscape. * Please note that the interior of the Peninsula cabinets has a black finish. 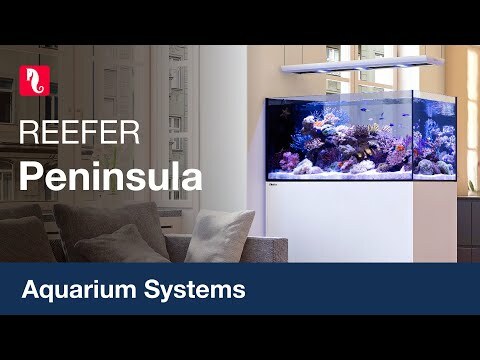 The REEFER™ Peninsula Deluxe incorporates the all-new ReefLED™ 90 lighting units with Red Sea’s customized hanging system into the Reefer reef ready systems in a convenient single package. At the heart of the ReefLED™ is a compact Led array that provides a reef-safe range of REEF-SPEC light through a single REEF-SPEC Blue (23,000 Kelvin) channel that consists of an optimum combination of ultraviolet, violet and blue LEDs and an 8,000 Kelvin white channel. In addition, it has a separate dedicated 3W Moonlight channel to provide the low levels of light for reef-safe nighttime viewing. The ReefLED includes a single optical-glass, hollow lens that creates a homogenous light, giving a dramatic coral coloration and a gentle shimmer throughout the aquarium. ReefLED is controlled by Red Sea’s ReefBeat® App which provides a wide range of easy to use functions such as random clouds, acclimation for new installations and a lunar cycle for the moonlights.